Hawks at Turbary Woods Owl And Bird Sanctuary, Preston Lancashire. 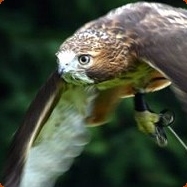 This is Nanook, a Harris Hawk and is used on our flying display and educational talks. It is a popular species in falconry, as they are the easiest to train and the most social. 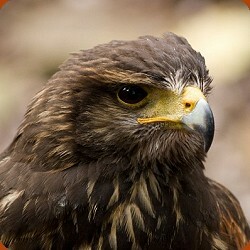 The Harris's Hawk or Harris Hawk (Parabuteo unicinctus), is a medium-large bird of prey which breeds from the southwestern United States south to Chile and central Argentina. It is a popular species in falconry and has been reported at large in Britain. The Harris Hawk is famous for its remarkable behavior of hunting cooperatively in packs, most raptors are solitary hunters. This is Kissy, a Kestrel and is used on our flying display and educational talks. The Kestrel is a popular species in falconry. Charlie, our Red-Tailed Hawk at Turbary Woods Owl and Bird of Prey Sanctuary in Lancashire.